For those living in Mobile Homes or manufactured homes, it's vitally important to check the tie-down straps every year! Just think of these straps as seat belts for your home. Oklahoma law requires that all manufactured homes have tie-downs. These tie-downs serve as a necessary part of a a mobile home's foundation system, without which the structure is extremely vulnerable to strong wind. The problem is that many mobile homeowners don't check tie-downs and anchors on a regular basis after an initial move-in inspection and they're hidden from view by skirting. If someone has been in a mobile home 10 years, the chances are great that the tie-downs are either rusted, or have been loosened due to the constaint Oklahoma wind. Consumers should check the condition of the straps, making sure they're tight and not corroded or rusted. 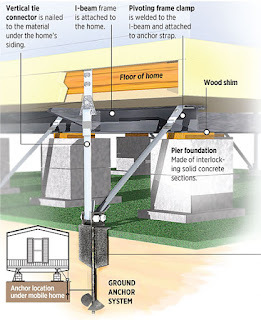 They also should check the anchors that secure the home to the ground. Anchors should not be paved over or buried completely in dirt because the weight of the cement could cause straps to snap, and fertilizers used on gardens surrounding anchors could cause corrosion. In large part, the safety of Oklahoma's mobile-home residents depends on getting the word out that tie-downs need to be tightenend regularly after years of wear and tear, they may even required to be replaced. Mobile home owners should call a mobile home moving company for inspection and possible replacement of the bricks, straps, or anchors.